The most important years of a child’s life – for building cognition, character and identity – are the first five. Since up to 85 percent of these key developmental abilities are formed by age five, early childhood education offers incredible potential that we are just beginning to tap. The region’s Jewish early childhood education (ECE) centers play an influential, yet often unrecognized, role in introducing children and their families to Jewish life. With 230 educators reaching 1,000 children in 80 classrooms, they are among our best hopes for developing healthy, successful learners and for providing gateways to current and future Jewish engagement. 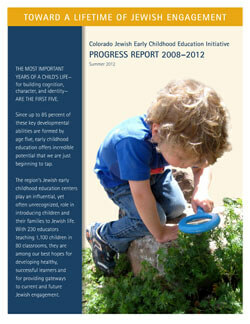 Rose Community Foundation, along with our partners on the Colorado Jewish Early Childhood Education Initiative including Allied Jewish Federation of Colorado, Colorado Agency for Jewish Education and The Jay & Rose Phillips Family Foundation, have sought to improve the quality of ECE centers, promote Jewish identity and expand access to Jewish ECE for families. This progress report documents how our work is directly producing better teaching, better learning environments, better integration of Judaism into ECE curricula, and better connections between families and Jewish Life.